Wishbone Day: If fundraising is your motivation for taking part in Wishbone Day, you've missed the point. Wishbone Day is not a fundraising event. It is not a missed opportunity to raise money. If fundraising is your motivation for taking part, you've missed the point. Every year in the lead up to Wishbone Day I am asked about why Wishbone Day is not a fundraising event. People often question it's design as a missed opportunity to raise money -- the typical purpose of awareness campaigns -- especially for those surrounding disability. 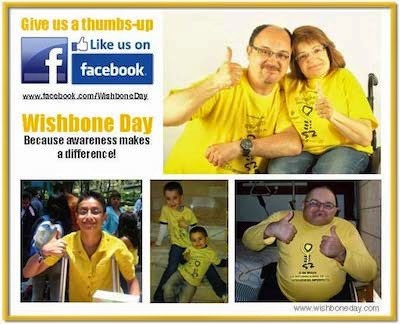 People with OI, their families and friends created Wishbone Day. They wanted to be listened too. They wanted to be acknowledged and taken seriously. But most of all they wanted a community in which they were connected and that they belonged. Wishbone Day was created as a platform on which these voices could be heard and that communities could be built. Fundraising was very deliberately left out of the Wishbone Day design and intention. Because if you couldn’t fundraise, there would be an opportunity to do something else. When Wishbone Day was created it was an invitation to the world to join our OI community – and to become one with us. It was an invitation to have conversations about who we are and what matters most, and to have others really listen and to understand. It was an invitation to play with us, to work with us, to eat with us, to accept and love us, and to celebrate with us! It was an invitation to create together a community in which we all truly belonged. Wishbone Day was a new beginning. And in accepting the Wishbone Day invitation you choose to become one with us. On Wishbone Day we ask that you join with us as equals … not to cure us or to make us better … but to really be with us … to celebrate all that we are together, right here, right now. Enough. Just as we are. Wishbone Day yellow shines with optimism and carries that promise of a positive future. It really is that simple. Fantastic Vincent! Thank you for organising a Wishbone Day Walk in Kenya. We hope you send us photos on social media using @WishboneDay or #WishboneDay. We can't wait to learn more about your event. Happy Wishbone Day!!! Excellent. I hope scientists can find the cause and cure. I hope we the public can create awareness and support system. God bless those people with OI and their family members.